In awake of a renewed outbreak of the Ebola Virus Disease in Liberia, this has KILLED so many people in Liberia, Guinea and Sierra Leone and still poses a threat including health workers. To date in Liberia 70 people have contracted this deadly disease while 46 of our compatriots have died. These numbers will rise if we do not listen to the advice from the Ministry of Health and Social Welfare and Partners. I call on all Liberians to now see the Ebola Epidemic as a national public health emergency. For those who do not believe that Ebola exists in Liberia, I want to inform all Liberians in this public manner that the disease is REAL and is in our country killing people. It is as I speak, taking the lives of our citizens in Lofa, Montserrado, and now Margibi County. Ebola spreads through physical contact with a victim of the disease. The virus also spreads through: sweat, saliva, blood, by touching the vomit or urine of somebody who is sick with Ebola. These deaths are mostly due to denial, touching dead bodies or participating in Burial Ceremonies. Avoid touching dead bodies or body fluids or materials of infected Ebola persons. Avoid direct physical contact, such as handshakes, kissing and direct contact with body fluids of infected or dead persons or animals. Major issues confronting the response teams include but not limited to keeping sick people in healing centers, prayer homes and other non-medical centers. These practices create public health hazards to families, neighborhoods and other innocent people. It is illegal under our public health law to expose the people to health hazard such as Ebola. Let this warning go out, anyone found or reported to be holding suspected Ebola cases in homes or prayer house will be prosecuted under the laws of Liberia. The Government of Liberia and Partners have done this much: training of health workers; community health volunteers; established treatment centers in JFK, ELWA, Foya and Firestone Hospitals; established Ebola testing center; social mobilization and psychosocial support; improved surveillance system and contact tracing. We will continue to do more. I call on you my fellow citizens to protect yourself, protect your family, and protect your community from this deadly Ebola virus, by taking all necessary precautions. Symptoms of Ebola typically include: weakness, fever, headaches, diarrhoea, vomiting and stomach pain. Additional signs include rash, red eyes, internal and external bleeding, chest pain, and sore throat. As the number of cases and deaths of Ebola Virus Disease continues to rise in our sub region, we are all gravely concerned by the rate at which this cross border transmission is taking place. Drastic action is indeed needed on all fronts to immediately stop this spread. This can only be achieved through a robust and incisive response in fighting this spread. I call on all our Nationals and County leaders, traditional and religious leaders, civil society, international partners, and all citizens to join hands in fighting this disease. With God on our side, Liberia will win the fight against Ebola! 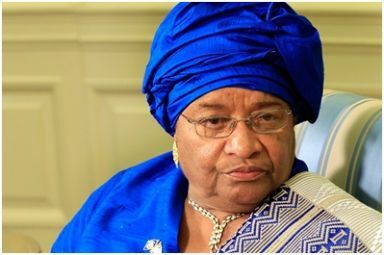 African Leaders’ Children Succession, Is Liberia Next? Chief Justice Francis Korkpor Will Uphold Press Freedom?